Getting a house ready to sell is no small task, here are some common overlooked items that will help keep you on track in getting your house sold quick! When preparing your home for sale unless your home is in major disarray don’t do any expensive remodeling jobs. You’ll want to save that money for future repairs that the buyer many want to have done through the buyers repair request. Don’t forget that you’re probably selling your home to buy another one and unless you’re paying cash for your next home you’re going to need a loan. I tell you this because you’ll want to make sure not to incur additional debt for any repairs brought on by credit cards and loans. Make sure to protect your credit scores during this time so you don’t have an issue qualifying for your next loan. Windows and Doors – Make sure to check all windows and doors, you’ll want to ensure they open correctly and easily. One of the easiest things to fix is a sticky sliding glass door and a non-functional door can leave a bad taste in the buyers mouth. Additionally do an inspection of all your windows and make sure there are no broken or cracked windows, if there are make sure to repair or replace them prior to listing your home for sale. Also make sure all your doors function properly and don’t make noise when you open and shut them. If any doors are creaking or not working properly a little WD40 on the hinges or slider track should do the trick. Also ensure all the door knobs turn easily the doors do not stick when opening or closing them. Lastly, a qqucik coat of pain on the doors might also bring the pop your home needs. Buyers will go through the entire home so you want to make sure to create the most positive impression in their mind. Odor Control – If you smoke in your house you’ll really have your work cut out for you. Smoke is hard to get rid of becasue it gets in the walls and stains ceilings. If you have these problems you’ll want to paint all the rooms including the ceilings. Next do not smoke inside the home when the home is for sale and when it is for sale some glad plu-ins wull help mask some of the left over smell. Pets – I am a pet owner and a Realtor so please understand this comes comes from a good place and good intentions. Pet’s do put off odors, even when they are highly pampered! Just because you as the pet owner are now used to the smell doesn’t mean someone else will be also. In fact, there’s a good chance that the buyer of your home will smell any issues as soon as they walk into your home. If you have cats, make sure to empty their litter boxes. During showings it’s best to get your pets out of the home, nobody wants to hear a barking dog and many people are allergic to cats which could be a huge deterrent in someone purchasing your home. Plumbing and Fixtures – Be prepared for buyers to fiddle with things such as turning on faucets, pulling on anything with a handle, flushing the toilets and switching on and off all the lights. This is a common behavior for buyers just going through the buying process and sellers need to be ready for it. Make sure to have your faucets and fixtures looking clean and shiny. Additionally make sure all faucets fixtures are operational, ensure all fixtures have working light-bulbs. RELATED: Can't Pay Your Mortgage Payment? Full Cleaning – Think your done in the process of getting a house ready to sell? Not quite… cleaning is is the very last step but a hugely important item. You’ll want to make sure your home is spotless, go through and make sure you don’t have stains on counter-tops, flooring, etc. Many times it’s best to have a cleaning crew do your full cleaning for you as they are a fresh set of eyes on your home and will scrub it top to bottom. If you notice stains in your carpet and your flooring doesn’t need to be replaced then opt for some carpet cleaning as well. You want your home to be as clean as possible and show with it’s best foot forward. Last but not least… if any items discussed on this page are non-operational and cannot be fixed then you’ll want to have them repaired or replaced by a licensed contractor. You never want your buyer leaving the house feeling like your home wasn’t taken care of. The cleanest home in the world won’t sell if many items in the home have to be repaired. All this may sound like a lot of work but it’s actually pretty easy, just plan ahead and take one thing at a time. 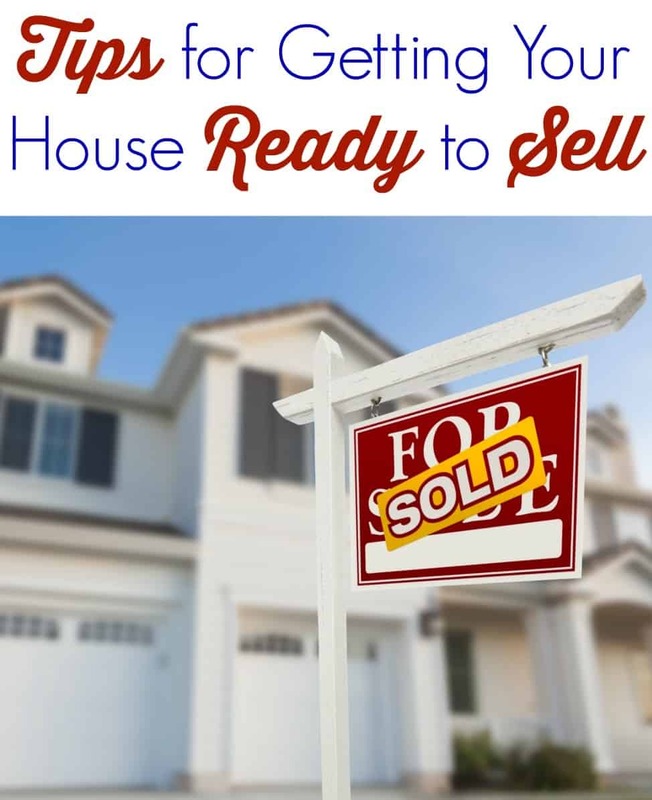 We hope you enjoyed our article on Getting a House Ready to Sell, if you have any questions please feel free to contact us anytime or feel free to post a comment below!